Molly's Musings: Kafka Story Takes On New Life In The Theatre — Again? Kafka Story Takes On New Life In The Theatre — Again? 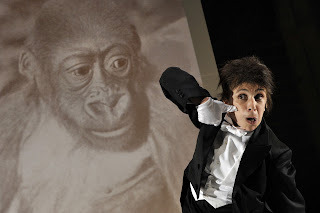 Kafka’s Monkey is distressing, fascinating, and riveting because Kathryn Hunter subsumes her human self and becomes an ape. She is dressed in white tie and tails and can do a sweet soft shoe, but she is an ape, with her gamboled gait and swinging arms that bend back and off kilter. When she speaks her voice and intonation are not quite … human. For Kathryn Hunter enters the stage, crouched and dragging a suitcase and cane, as “Red Peter,” a male chimpanzee from the Gold Coast who was shot and captured by Europeans. This ape in man’s clothing has learned that, while freedom is impossible, he can find his way out of total captivity by emulating man. He learns to drink alcohol and spit to be a man, and even learns to speak and swear. So completely humanized has he become that Red Peter has a pretty silver flask that fits neatly into his jacket pocket, just like a Jazz Age swell. This sort of piece is not merely imagined and written. No open call discovered Ms. Hunter. This is a joint creation developed by theatrical colleagues. Colin Teevan adapted Franz Kafka’s “A Report to an Academy” to create — along with director Walter Meierjohann and Ms. Hunter — this unusual bit o’ theatre. It is one miserable story magnificently enacted at the Baryshnikov Arts Center where Theatre for a New Audience is presenting The Young Vic’s production. Walter Meierjohann directs Ms. Hunter, who worked closely with the Royal Academy of Dramatic Art’s movement director Ilan Reichel as the ape in Kafka’s story, who is specifically a chimpanzee in Ms. Hunter’s interpretation. Kathryn Hunter as Red Peter with his Baby picture. Photo (c) 2013 Keith Pattison. A massive photograph of a baby ape’s face dominates the stage. There is a stool, two bananas, and a lectern. Otherwise the theatre space is just that — a space with lights and ladders and poles and pulleys. Kafka’s Monkey needs no more. Its point is funny and sad, and its audience must laugh as well as weep. It is the story of a chimp abducted and tamed and trained for various purposes— a European zoo, perhaps a laboratory. Eventually, Red Peter says, he chose life on the stage instead of captivity in a zoo and has become a renowned music hall variety star, come this evening to address a scientific academy — and an adventurous theatrical audience. Kafka’s Monkey is an indictment of humanity for its acts against all life. For all my rapt attention and shame at being human, Kafka’s Monkey did not feel precisely like a play. Not because it lacks a beginning-middle-and-end, but rather because we wait while Kathryn Hunter struts her hour on the stage, we wait for the story to go … somewhere else. Eventually, just as the Ape says there is, in fact, no way out despite his “accomplishments,” he spies the Exit sign, and goes out. Terrific story. But a play? 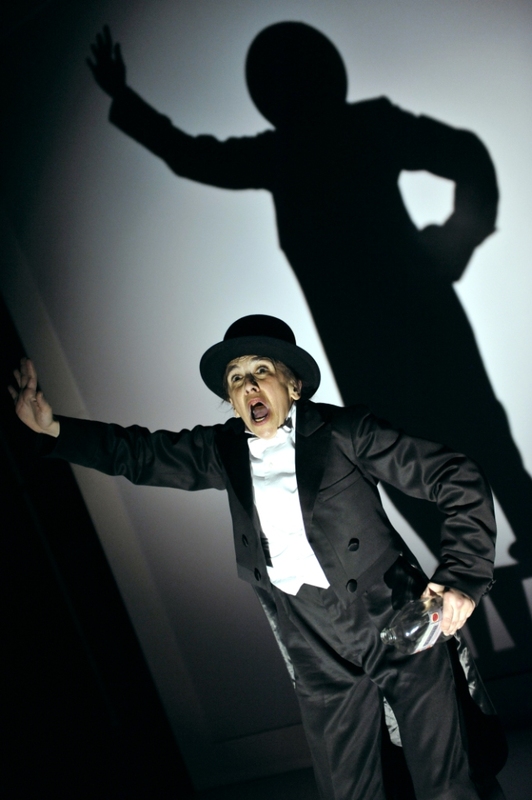 Kathryn Hunter in Kafka's Monkey. Photo (c) 2013 Keith Pattison. Ms. Hunter as Red Peter stares down members of the audience as any animal would. Watching Red Peter interact with members of the audience, grooming a man’s hair as he would a fellow ape, and eating the nits found there, is a delight. He also kindly shares a banana with another member of the audience. Red Peter’s speech patterns go from cultured European gentleman to chimp chatter and shrieks to an angry man. Er, ape. He hangs from ladders and twists and turns and contorts his body till we wince. He gazes at us, forcing us to look into his eyes and see ourselves. After the fact, I recalled a scene in Cabaret in which the Emcee dances with an ape in a flowered hat and a frilly skirt, singing “If you could see her through my eyes….she wouldn’t look Jewish at all!” I wondered, was that Kafka’s monkey? The short story was first published in 1917, and has been discussed and critiqued for decades as to all its possible meanings — including the assimilation of Jews into Christian society — and the cabaret scene of Weimar Germany combined various forms of high and low culture. Or perhaps it was just the cleverness of Kander and Ebb. In how many other places, references, had I already experienced pieces of Kafka’s story without having read it, and without knowing? Run don’t lope to the Baryshnikov Arts Center’s Jerome Robbins Theater on 37th Street between 9th and 10th Avenues to see this limited engagement (April 3-17). Luckily for us, the remarkable Kathryn Hunter will return the following week for another short run in Fragments, from the texts of Samuel Beckett, as directed by Peter Brook and Marie-Hélène Estienne. She is a performer worth traveling to see. ~ Molly Matera, signing off. So much to read and see, so little time…..